Student loan debt is often unavoidable for any college student. One of the issues, however, comes after you’ve graduated and you find yourself staring student loan debt in the face. The pressure is on to find a decent paying job. But, if you’re smart about managing your student loans debt, it may not be as difficult as you think. Expenses add up quickly and often without us realizing it. From books and everyday necessities to tuition; college is expensive. Before you consider a student loan, don’t forget that there are several free options for finding money for college. You’ll also want to avoid defaulting on your student loans, just so you don’t have that hanging around on your credit history. You can take a look at some of my financial tips for college students as well. Did you know? More than half of college graduates begin their first year out of college with a $20,000 student loan debt staring them in the face. And it could be even more if you’re also going after a graduate degree. But, at least by that time you’ll be able to access further grants to help you out. Find a job as quickly as possible but be particular as financially feasible. While job searching, create a record of loan liability. Dig out those old loan papers and know what you’ve agreed to. Create a budget that includes all of your expenses. Plan carefully. Determine how much you need to live on for everyday expenses and how much you need to pay on your loan. You may have to find a part time job until the job of your dreams comes along. You might even find yourself working two or more jobs. Avoid incurring more debt, including credit cards. You can’t expect to live the lifestyle of your parents just yet. That will come. Curtail your expenses until the debt is paid. If you’re not married, share living expenses with someone including an apartment and car. Minimize eating out, cook at home, don’t send your clothes to the laundry, wash them yourself. Establish a good credit rating from the beginning. If you don’t, it could follow you the rest of your life. Make your payments on time and even a higher than minimum payment if you can. If you have debts other than your student loan pay them off in a timely manner as well. Consider debt consolidation only as a last resort. If you find yourself in a position where you can’t make a payment on time call your lender and discuss it. Let him know you’re trying and are concerned. Perhaps he could give you advice on better budgeting. Also inform your lender if you move or change jobs. If their statements to you are returned it will not look good on your credit report. By the way, always check the statements for errors. Be professional and honest. Borrow only what you need and be responsible for the money owed. Control expenses. Perchance, if you fall on hard times, you could arrange for a lower monthly payment or request an extended grace period. A loan forgiveness program could be arranged with extenuating circumstances. This would forgive your loan but you would repay by volunteering at various community organizations. Serving in the military could be another option in lieu of payment. Until you get on your feet, request that family members give you cash for birthdays or other special occasions instead of that tie or scarf you really don’t need. And, it’s a good idea not to lend money to friends, especially if you’re trying to get out of debt yourself. You may lose both your money and your friend. 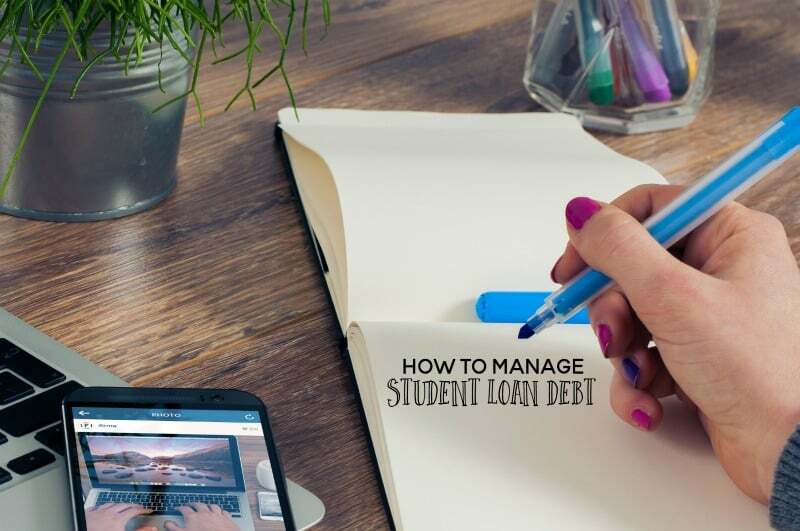 How you handle your student loan debt could very well lay the financial groundwork for your future. Keep saving and keep at it and before you know your student loan debt will disappear. And, at the very least, that will be one less debt that you will have to worry about. If you really do need to get a student loan, be sure to check your FAFSA completely so you’re maximizing the opportunities that you have there. 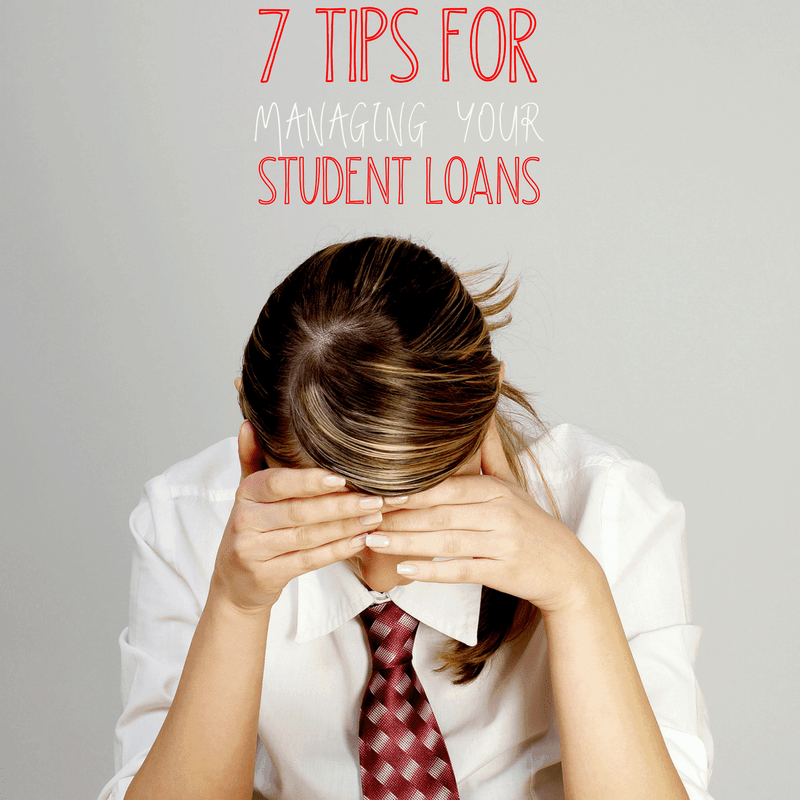 I hope that you’ve found these tips for managing your student loans helpful! Awesome tips! It’s okay to be on a tight budget in your twenties-more often than not, everyone is. That’s the time to be building strong credit and solid budgeting habits.